2014 has shaped up to be the year Digital Transformation took root as a unifying theme for IT and business services. What's been exciting about Digital is much of the technology is already available, and it's the digitization of business processes to enable plug-and-play services, more meaningful data and more seamless business models designed for mobile and cloud business environments. Digital is not really about digitizing the way we've always done things, it's about digitizing the way things need to be done to be more competitive and effective in the future. Digital is also about progressing our talent to operate with digital mindsets, by adopting analytical, creative approaches to help their enterprises progress from creaking, legacy business practices. Nearly every major IT and business services provider is now using the term Digital in its go-to-market messaging today. But that level of activity and interest means the phrase has taken on an extraordinary breadth of meaning. So much so, perhaps, that one might argue it is becoming increasingly meaningless as a descriptor of activity. HfS’ Ned May recently set out to clarify our definition of Digital Transformation and to explore the positioning of the leading IT and business services providers in the today. Rather than narrowly define and coral the topic, he cast a wide net with the goal of highlighting the full range of activity currently underway. 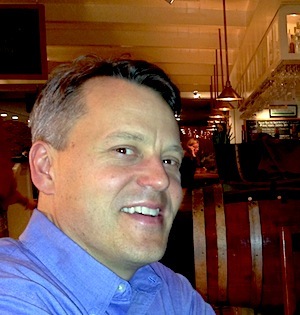 His rationale for this approach being that Digital Transformation does not merely represent a new external market opportunity for service providers, but it is also a major catalyst to reconfigure the very markets in which they are operating. 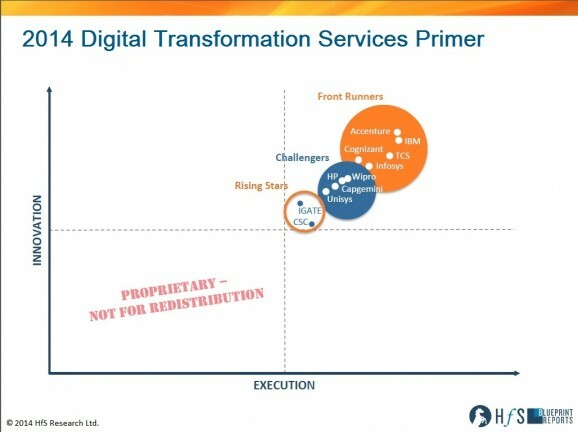 To this end, we have published what we are calling a Blueprint Primer Report that evaluates this emerging Digital Transformation services landscape, the significant participants and their early positioning and achievements as they vie to take many of their clients into this digital dimension of service delivery and capability. So how did the early front runners shake out? Ned, let’s start with what you mean by Digital Transformation. Can you elaborate? Thanks, Phil. As you are aware, it can mean many things but in its purest sense we see Digital Transformation as the changes that must occur when a business moves away from a physical task. For example, the shifts that occur in underlying processes and infrastructure when one sells goods online rather than in physical store. As such, you could argue that Digital Transformation is as old as information technology itself. So... why, suddenly, is "Digital" as a moniker beginning to stick again? Ah, good point and to quote Yogi Berra, its Deja vu all over again. But there’s good reason. We are entering another period of accelerated development and economic advancement that is being driven by technology. The last wave was also fueled by Digital technology, but driven by the web and the broader internet the gains this created were primarily centered on improving existing operations. Information became cheaper, moved faster and became available to nearly everyone - whether an employee, customer or partner. That transparency drove out waste. Today, we are seeing another wave of Digital, however this time it is different. It is fueled by a cross pollinating collision of three things: the proliferation of mobile devices, the development of sophisticated analytics, and the emergence and maturing of cloud delivery. In short, computing is now spreading out to the edges of every activity we undertake and in conjunction we are now able to glean meaningful and actionable insight from this activities at reasonable cost. None of this is new. It’s been the subject of visionaries for years. What is transformative today is that it is increasingly economically feasible. As such, leading enterprises are adopting these technologies to drive business gains, and laggards are realizing they must either keep up or they may be forever left behind. You mention in your research that Digital Transformation is already here today. Where do you see this activity? Yes, and I can not say it enough. The future is not waiting for tomorrow. It is here today and we have been documenting it over the past year in our research and for those hoping to reference some definitive turning point, you are waiting in vain. So... what then does Digital Transformation actually look like? New business models emerge. As IT service providers look to push a message of transformation, they are being asked (or afforded) the opportunity to embrace this themselves. As a result, we are seeing a rise in revenue gainsharing models where a provider delivers a set of underlying services in exchange for a share of profits pegged to a specific business outcome. Bottom line: Digital Transformation will rewrite the underlying economics for services firms. Sacred operating models get shattered. When a new market emerges it does so via a set of new definitions that establishes its uniqueness and allows it to take shape. These “rules” often take on significance of their own but as the market evolves into a mainstream opportunity, these rigid definitional distinctions ultimately become obstacles not advantages. Such is the case today with Cloud, Analytics, and Mobility. The core concepts matter but greater value is obtained by taking a broad and open approach to the enabling technologies and what they can bring. A focus on infrastructure readiness prevails. As providers push their messaging around the positive outcomes that digital transformation can bring, they are being asked to rationalize disparate legacy apps to enable this change. This raises the focus on solving the challenge of infrastructure readiness and who can best weave it all together. Bottom line: Digital Transformation requires us to fix many of our old problems before we can realize its promise. Old technologies become new friends. As new markets emerge, they often revolve around shiny new features that ultimately cloud our ability to extrapolate where they are truly headed overall. True progress comes when we move beyond this feature focus to embrace the whole. Take for instance the mobile market where early on we saw smartphone Apps become the end rather than the means. Today leading services providers are thinking well beyond this and presenting Digital Transformation offerings that leverage the full capabilities of these phones and integrate them into how a business is run not just how some information is accessed or displayed. Bottom line: Digital Transformation requires us to look beyond the obvious in what new technologies offer. Old friends become new technologies. In a similar fashion, Digital Transformation creates opportunities for new forms of information and insight to be gleaned from the traditional ways we already conduct business today. For example, email trails are being mined via sophisticated analytics to determine patterns of communication that may indicate future problems among partners. Sensors are now being deployed on physical objects to allow them to become part of information context that was impossible before. Bottom line: Digital transformation requires us to look for new insight among existing processes and tools. Despite the current activity being well underway, it is important to point out we remain in the earliest of stages for this market and the battle for dominance continues to play out – both across the underlying enabling technologies as well as the providers themselves. After all, the iPhone - arguably one of the single greatest drivers of this opportunity – is only seven years old. These markets are moving fast and there is a tremendous amount at stake for every participant – be they hardware, software, services or some combination of all three. Expect the activity to intensify. So with that, how do the providers stack up? Digital Transformation represents a diverse set of activities – everything from modernizing a back office legacy application to designing a new customer engagement model to be delivered via a mobile app with many disparate services in between. As such, conducting an apples-to-apples comparison across providers requires a high level view that compares outcomes rather than individual underlying technologies. In the realm of Digital Transformation, HfS groups IT Services providers in one of three circles as determined by the maturity of their offerings and capabilities within this emerging market. Front Runners. Accenture, IBM, TCS, Cognizant and Infosys occupy the select group of “Front Runners” as each has demonstrated having the industry expertise and technological innovation to craft leading edge solutions across a variety of clients. These providers make a great fit for those looking to aggressively embrace change – understanding the level of challenges and opportunities that breaking this new ground will entail. Challengers. Wipro, HP, Capgemini, and Unisys are this year’s “Challengers” with each in the hunt for the top positions though they could all benefit from greater coordination and centralization around their entire portfolio of Digital skills. These providers make a great fit for an enterprise that brings a clear but more measured vision of adoption. Rising Stars. IGATE and CSC round out this year’s “Rising Stars” with each providing strong examples of Digital Transformation though now needing to do so on much broader scale. Providers in this wave make an excellent choice for those looking to experiment and want a strong partner to co-develop a solution. In your view, how should a business or technology executive should approach Digital today? First and foremost, there is the need to assess your organizational appetite for change. As the most significant new selling opportunity of a decade if not more, Digital Transformation is generating tremendous buzz across the IT Services landscape. Nearly every major provider is aggressively marketing themselves as a leader in the field today. So what is a buyer to do? Enterprises are advised to assess their internal appetite for change. If you are still at the experimental phase and only looking to test the waters of Digital, a skilled partner from the lower left might be willing to invest more energy getting you where you want to go in return for becoming a reference account. However, if you are in a market or industry that needs to quickly go all in, you may be better off with a front runner today. Also understand that some firms excel at execution while others excel at innovation and these relative strengths can differ within an individual provider’s own big MAC. We include a diagram highlighting these distinctions for every provider in the report. For example, one portrays a firm that is strongest in mobile innovation and brings balanced strengths in Analytics but lags a bit around innovation in Cloud. Enterprise buyers should use these diagrams to match a provider’s strengths with the skills they need. And finally, where do you see Digital Transformation headed in the second half of 2014 and beyond? While the upside around Digital Transformation is significant, and providers should and are addressing it now, it still remains in dollar terms fairly nascent today. The same is true for many of the technology deployments. So while new business models are visible and new revenue streams being realized, they remain far from the norm. While a flurry of buzz words will continue to flow around this space in 2014 and beyond with the likes of Systems of Engagement and the Internet of Things both gaining ground, the bulk of activity for services providers will continue to center around three activities. Adding a few major reference transformation projects. As this occurs, deep industry expertise as well as analytics skills will become increasingly in demand. So too will be the need to form actionable partnerships with other services providers and to organize oneself to market and sell in more efficient ways as multiyear infrastructure and process deals get squeezed out by ongoing collaborations measured by business results. Ned, thanks for taking the time to describe the Digital Transformation Services market... we look forward to more continued coverage on this evolving market in the coming months. It is a great article and highlights the importance of Digital in today's technology driven world. I would like to add upon the point mentioned on appetite for Change. The assessment for such an appetite has to be done at a operational level involving people who will ultimately use the technology. Having worked in some of the large MNC's I have observed that decision to adopt to a new technology and buying such services from an external vendor is usually done by top management or CIO org. Eventually, when the implementation happens is when real utility of going digital gets evaluated. Great discussion and well thought out research into the Digital trends. Completely agree the compelling rationale behind Digital is the fact that most of the technology is available today and it's more about "HOW do can get there" than "CAN we get there". Interesting research. I notice some of the Indian suppliers are among the leaders - is this a surprise, or are they genuinely providing higher-end services these days? Jon. Great observation and I could see how it might be a bit of a surprise to see those suppliers all come in so high since they're still riding the last wave of disruption. Typically, companies only take these shifts seriously when their core business flattens but as a group most of the offshore providers have recognized this next wave and are all aggressively working on reshaping themselves for the opportunities and the challenges it will bring.